This is a scene in the tale of revenge of the Soga brothers who waited 18 years before killing Kudō Suketsune, the man responsible for the death of their father. 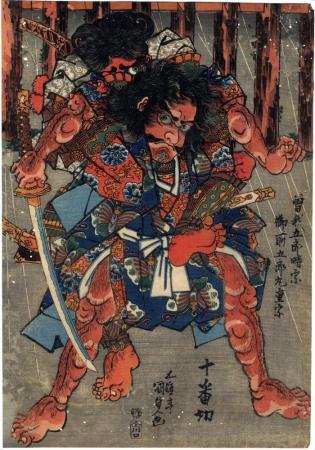 The jūban of the title refers to the 10 men loyal to Suketsune that the Soga brothers slew. There is a file online from the Art Institute of Chicago analyzing the imagery in a James Ensor (Belgian, 1860-1949) print of the Temptation of St. Anthony. It cites the battle scenes of Kunisada, and this print in particular, as one of the points of inspiration for this composition. We have added a link to that file above.